Target is getting a bit of a jump on “Black Friday” sales, and is selling the Star Wars 8017 Darth Vader’s Tie Fighter for $20. If you want to purchase it in store or from Target, you can check store availability here at Target.com. Because they have an arrangement through Amazon, you can also pick it up for $20 at Amazon plus shipping. 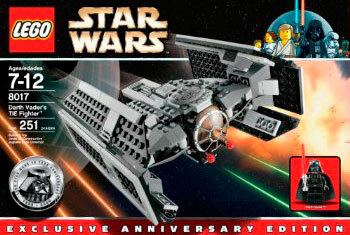 This model commemorates the 10th Anniversary of LEGO Star Wars, and is from Star Wars Episode IV: A New Hope, and comes with 251 pieces, which makes the price very appealing even if you aren’t necessarily into the Classic Star Wars line. It comes with a Darth Vader minifig as well.